Lexus's "December to Remember" ads, with the luxury vehicles done up in those famous giant red bows, have become as much a part of the holiday firmament as Santa Claus himself. And this year, Team One aims to capture the full spirit of the season by suggesting a new Lexus is the only thing that can give grown-ups that magical feeling of being a kid on Christmas morning. Three spots feature parents telling their children fantastical stories of how they received a Lexus for Christmas. And no, one spouse didn't just surprise the other by festooning it in an oversize ribbon and parking it in the driveway. "Christmas Train," which evokes The Polar Express, shows a Lexus IS F Sport sedan being delivered via rail from the North Pole. "Magic Box" shows how large objects, like a Lexus ES sedan, can come in extremely small packages. And "Teleporter" tells of a special ice-covered elf machine that transports a Lexus RX luxury crossover from a winter wonderland into a family driveway. All three spots end with the voiceover: "The magic of the season is here, at the Lexus December to Remember Sales Event." "I still remember getting bikes, Evel Knievel toys, Six Million Dollar Man dolls and so many more toys. What else, besides an awesome new car, could come close to that feeling now?" Jason Stinsmuehlen, group creative director at Team One, tells Adweek. "We're illustrating that with Lexus, you're never too old for toys." Team One presented a dozen campaigns to the client, but this one stood out. "We simply asked the question, 'If we were going to say Santa brought our new Lexus, and our kids wondered how that was possible, how would we say Santa was able to pull that off?' " Stinsmuehlen says. "Clearly the typical 'Santa's sleigh' narrative wouldn't explain how a new car could show up, so we embraced the innate creativity that exists in all parents. The overlapping storytelling voiceover that transitions to on-camera dialogue was the executional insight that made it work." Motion Theory director Grady Hall and postproduction company Mirada wanted the spots to have the feel of timeless holiday magic. "Our goal was to live up to the production values of any theatrical holiday film. It had to be epic, magical and yet totally realistic," Stinsmuehlen says. "We decided to shoot as much as we could in camera, including a giant train pulled on a flatbed truck down a Vancouver neighborhood street and building a huge LED arch for our teleporter to project believable light in our sets." After changing creative direction on this ad franchise regularly over the years, Team One thinks this one might have more staying power. "Visualizing a parent's imagination is about as free an exploration as you can ask for," says Stinsmuehlen. "My hope is that if this campaign gets traction, it'll be something we'll keep trying to top for years to come." And don't expect the big red bows, which have been around since 1999, to be thrown out anytime soon. 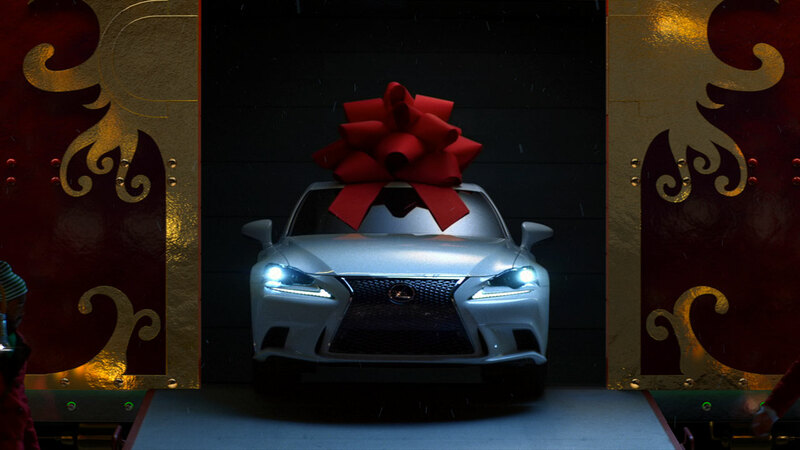 "The bow is a Lexus holiday icon that people know without even seeing a Lexus logo. We'd never walk away from something that powerful," Stinsmuehlen says. "It is, admittedly, one of those ad images that some have lampooned. But like the [Coca-Cola] polar bears and [Budweiser] Clydesdales, we hope it's an icon that's as welcome as any marketing during the holidays can be." Title: 2014 December Sales Event TV, Holiday Stories: "RX Teleporter," "IS Christmas Train," and "ES Magic Box"